Occasionally Scamp gets sent cool things to review like tasty salad bowls. 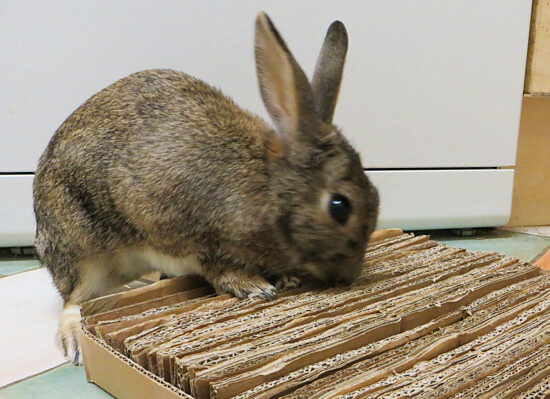 Recently he was offered a home monitoring system to try out, which seemed a slightly odd thing to offer a rabbit (no matter what Scamp thinks no one is going to steal his treats), but was actually a lot of fun. That square thing is the ‘hub’ which has an SD card to record too, and then there is an indoor camera, and outdoor camera, two sensors that detect doors/windows/cat flaps opening and a plug that you can turn on/off remotely. It was very easy to set up, you download an app on your phone, then press a button on the ‘hub’ and it links your phone and the hub. You then link in the devices e.g. cameras you want to use to the hub by pressing matching buttons on the hub and the device (camera/sensor etc.). It worked perfectly first time. 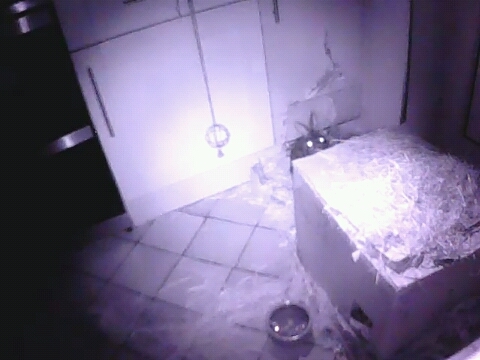 I set the cameras up first, that’s me watching Scamp sitting on his box from my phone whilst in a completely different room (do you think he knows?). It’s very addictive, I kept peeking to see what Scamp is up to. It’s also interesting to see how he behaves when I’m not there. 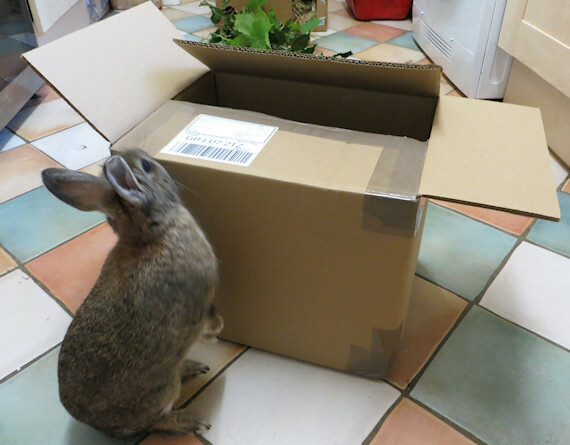 Like most bunnies, he has great hearing so if he’s up and about he tends to race to the door in time for me to open it – it’s hard to catch him just hanging about. With a camera, I get to see what mischief he was up to before I get there, for example, how does the hay get spread over such a wide area??? 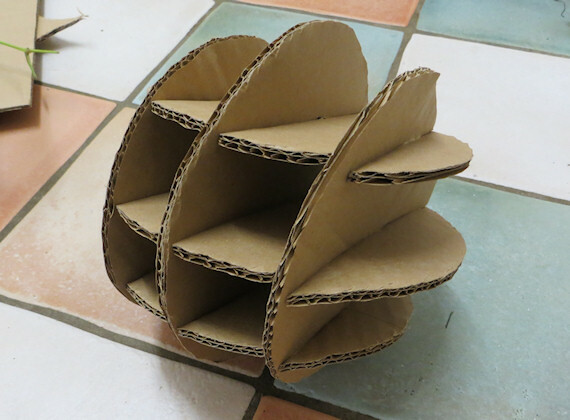 The answer… he stands on his box and digs at it until it gets thrown off behind him. Cute by day, scary little monster at night. 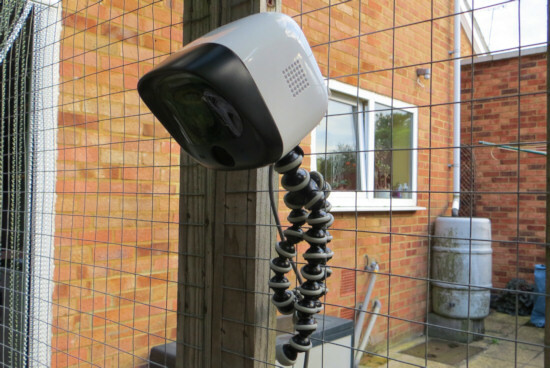 The outdoor camera is water proof and has a x metre long cable. I ran it from the house, out an ajar window and it worked fine even in the rain. It comes with a base you can screw to a wall, but the attachment is a standard camera mount so I used my bendy Gorrillapod so I could attach it where I wanted and move it about. If your shed/aviary/hutch is nearish the house you could easily run it like that. I know many bunny owners have quite well kitted out sheds so you might have power installed anyway. It can be up to 300m from the hub and still connect so you just need power near where you want it. It’s not just another room you can watch from, once you’ve set it up on your phone/tablet you can access it anywhere. My parents happened to be going on holiday so before they went I connected my mums phone to the device and asked them to report back on how it worked for very remote bunny spying. Big mistake! Did I mention the cameras have two-way sound? You can hear your rabbit and use a built in speaker to talk to them. It’s very creepy to know you are in the house by yourself (other than a bunny obviously) and suddenly hear someone in another room having a conversation with Scamp – although Scamp didn’t seem to mind. Worse, the indoor camera has a lullaby option that plays music, which I’m sure is actually designed for people monitoring babies not for attracting attention when you want to have a conversation via intercom on what you are up to on holiday! Lesson learned – remote viewing works great, so watch who you give access too! Pre-empting txts wondering where Scamp is, whilst he’s busy eating err exploring the rest of the house! You can press a button and take a photo and record video remotely if you catch your bunny doing something cute (or naughty). But, you can also set it to record automatically using door sensors, sound or motion as the trigger. 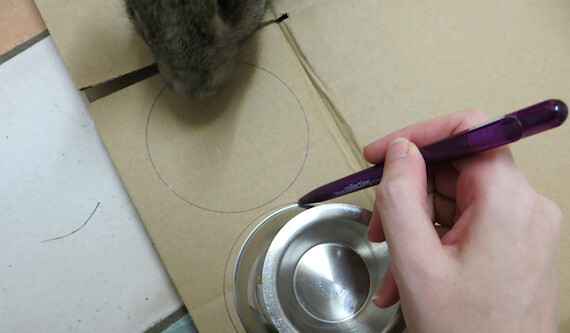 So for example, attach a sensor to your rabbits cat flap and then get a record of each time they go through. I was pondering what to up to test the motion sensors… and then I thought – poop cam. What rabbit owner hasn’t obsessed over whether their bunny is currently eating/pooping at some point or other? Not pooping is a sign of gut stasis and needs urgent vet attention, so if your bunny seems a bit under the weather or is recovering from being unwell, a poop cam would be perfect! You can check from work or see a record of when they used the tray. It would be handy too if you had a group of bunnies, because you could easily check who was using the tray which is tricky to monitor when they share. 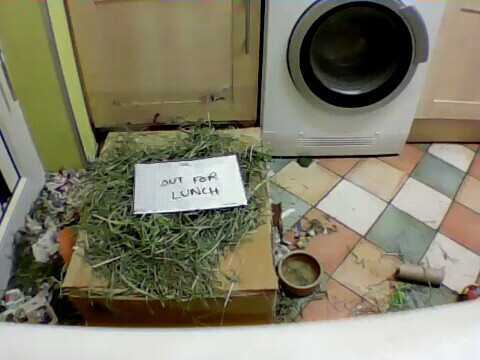 Anyway, I set up one camera on Scamp’s litter tray and one covering the rest of the kitchen (where he lives when he’s not out and about). His litter tray is just out of shot in the bottom right corner on Camera 1. So Scamp messed about a bit, napped, visited the loo and was surprising well behaved. The window/door sensors were as easy to set up as the cameras. The door/window sensors would work on a cat flap or a hutch door, or even on your garden gate if you were worried about people coming into your garden. There are two pieces and you fit them next to each other when the door is closed, and the system detects when they move apart and can take a picture or send an alert. They are completely wireless (they have batteries) and just have to be within 300m of the hub (which I think will cover most people’s gardens!). 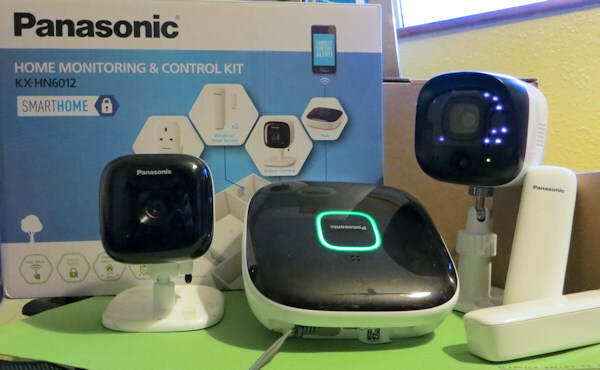 All round it was very easy to set up and use, the sensors and motion detection etc. all worked perfectly. It was fun to watch, and reassuring to be able to check what he was up when I wasn’t there. The only downside is I’d have liked HD quality recording, it’s good enough to see what he’s up to, but a little blurry for sharing photos with you of what Scamp’s up to. Anyone else use bunny spy cameras or tempted to get one? I’ve mentioned foraging, picking plants from the ‘wild’, before. It’s a great way to suppliment your rabbit’s diet. 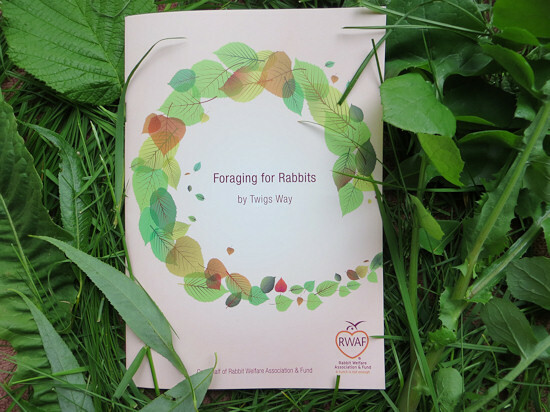 So, I was really excited to hear about a new book ‘Foraging for Rabbits‘ by Dr Twigs Way. I immediately ordered two copies (one for Scamp and one for you guys – more on that at the end). It’s the perfect little guide for anyone who is thinking about foraging but is a bit unsure where to start. 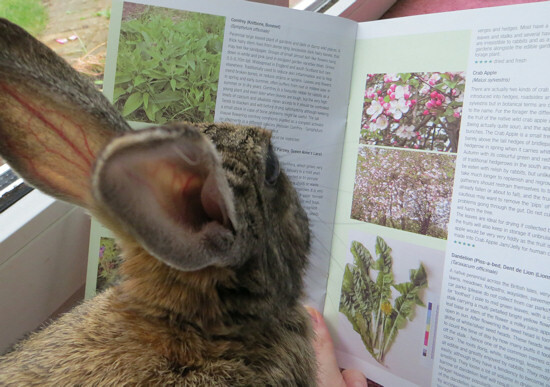 Whilst there are a lot of books on identifying plants, this book is written specifically for rabbit owners, in fact Dr Way’s rabbits have helpfully rated all the plants suggested on taste – afterall just because something is safe to eat doesn’t mean it’s tasty. In fact my favourite line from the book is in answer to the question: what if my rabbit doesn’t eat what I have collected? 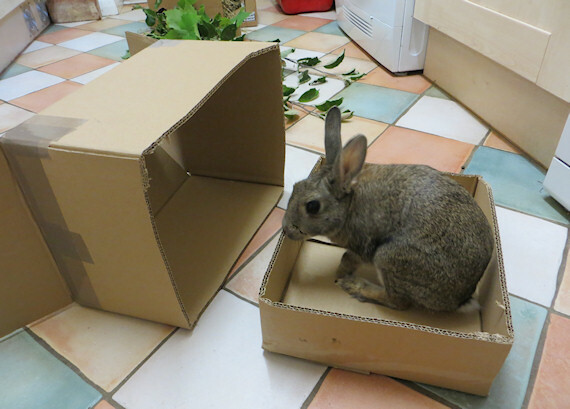 If a rabbit or group of rabbits does not want a particular plant but is/are otherwise eating then just take the plant away again (and apologise). Because we know who really is in charge! 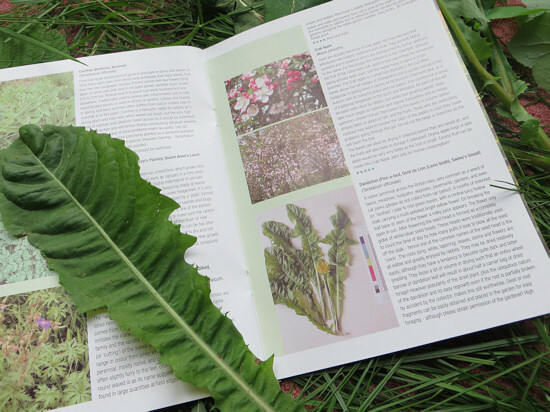 The book starts of with an introduction to foraging – why forage, where to forage safely, the law on taking plants, drying and storing forage, toxicity, and understanding plant names. All illustrated by cute photos of bunnies tucking in to tasty plants. The rest of the book contains just over 60 (if I counted right) common plants that you can forage. Each plant has a colour photo, the common and latin names, a description and some tips – for example when it’s at it’s most tasty, where to find it, if it dries well or if it’s good for something in particular and the taste rating (in stars). Most plants only have the one photo, but the latin plant names mean it’s easy to search online or in plant books for extra photos to help with an ID and the back cover includes a helpful list of plant reference books. The book itself if a nice size (A5/35 pages) to pop in your bag when foraging, unlike a giant tome that some general guides are. I’ve already tried out two new plants thanks to the book, both of which Scamp approved. You can also hear Dr Way discuss foraging in Episode 4 the All Ears Podcast here. 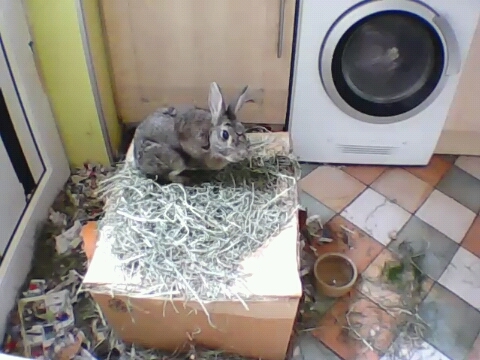 And me discuss rabbit behaviour and enrichment in Episode 8 here. 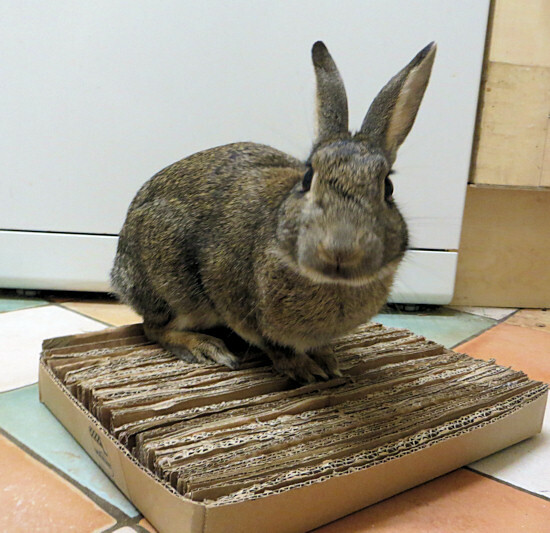 Foraging for Rabbits is available via the Rabbit Welfare Association here and costs £4. As I mentioned, I bought two copies, so I’m giving one away to my lovely readers. For a chance to win, please leave a comment below – why not tell me what you think about foraging – is it something you’ve tried or are thinking about tryin? I’ll draw a winner on 22nd June 2015. I was helping my sister put together some scratch pads for her cat when it occurred to me that Scamp would love this too. 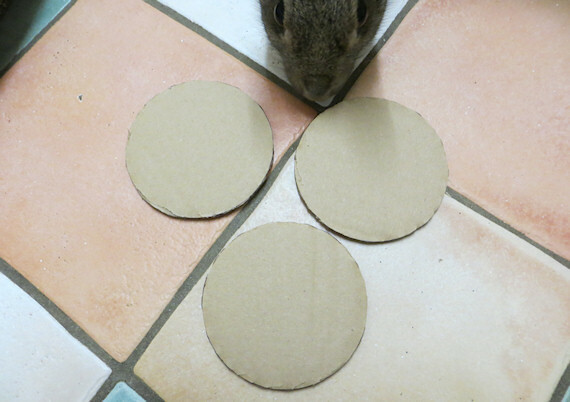 So here is how to make a cat scratching pad / bunny lounging mat / dig n shred toy. 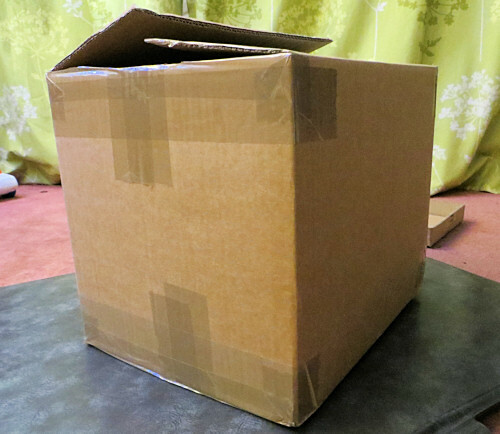 To start you need a box with a base about this size you want your finished pad. This ones about A4. You’ll need to remove any tape/labels so it’s bunny safe. 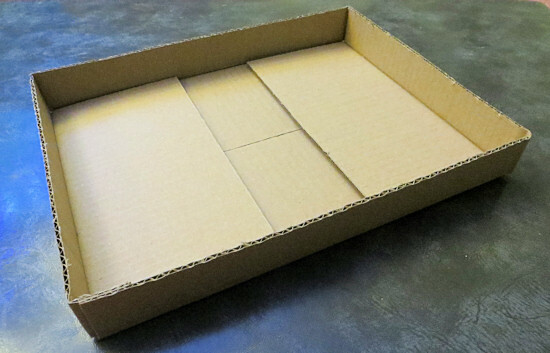 Using a knife or scissors chop around the base of the box so that you end up with a tray about 1-2″ deep. 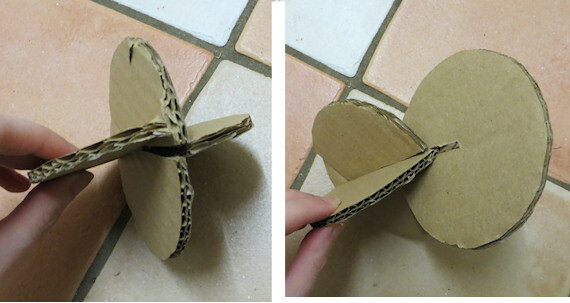 Don’t discard the rest of the box – you’ll need that next. 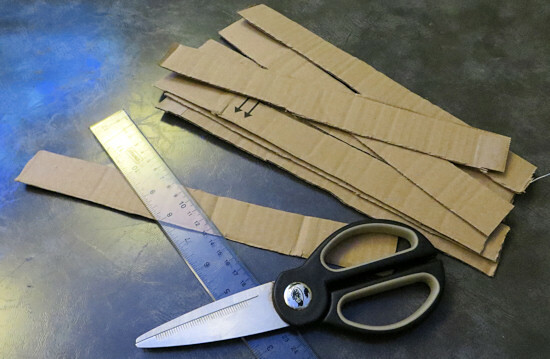 With the left over cardboard (you may need an extra box) cut strips the same length as the length of the tray and the same width or slightly more than the depth of the tray. 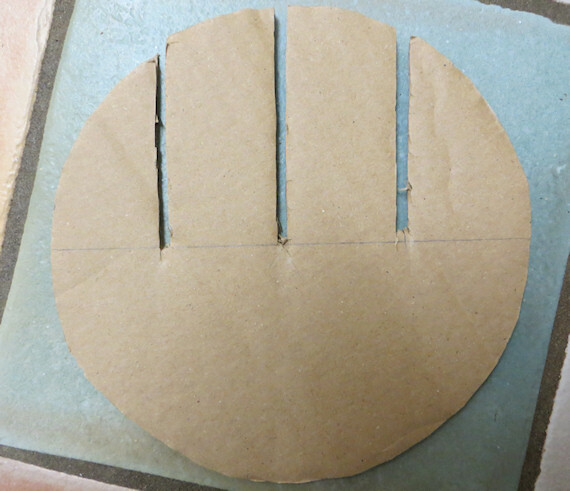 So if you tray is 12″ long and 2″ deep, then cut strips 12″ long and 2″ wide. 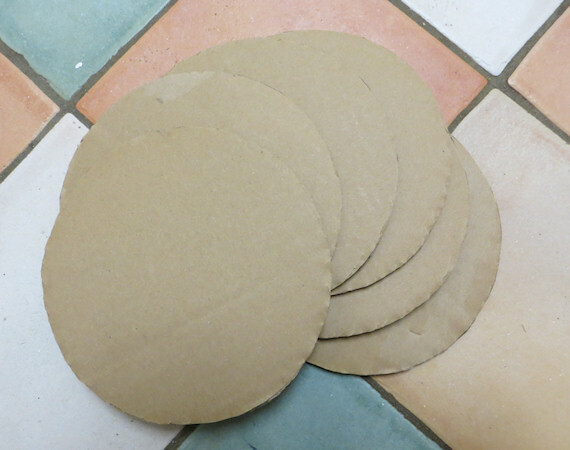 The easiest thing is to cut one, pop it in the tray to check and then use that as a template. Don’t worry about being too perfect – it’s probably going to get shredded anyway! 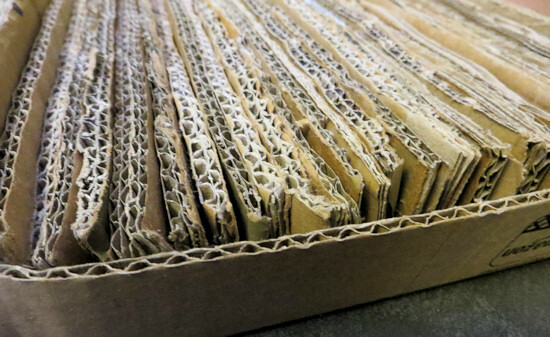 How many you’ll need will depend on the size of your tray and the thickness of your cardboard. 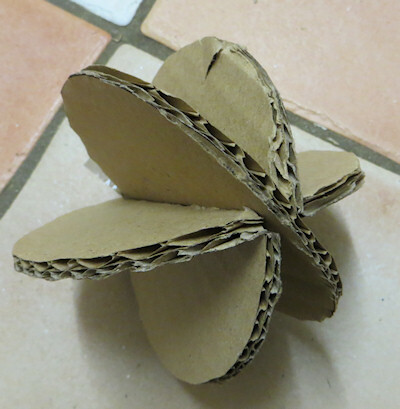 Pro tip: finding it a bit of a flaff with craft knife or scissors – use a bread knife – it whizzes through cardboard! 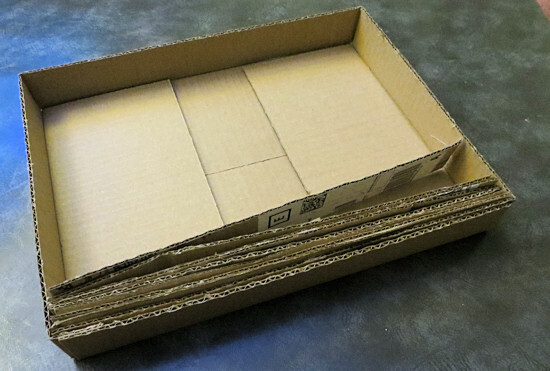 Once you’ve got a good handful of strips you can start slotting them into the box. The strips go in on end. Stop at the point you try to wedge one more in and the whole lot pop out in protest … then put them all back in minus that last one. 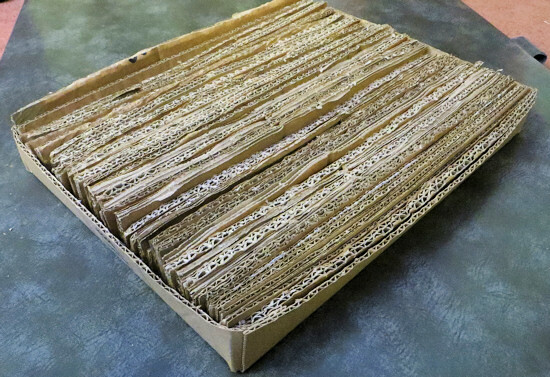 You should now have a lovely dense cardboard mat perfect for sitting in, digging at and generally shredding. You could make it more fun (and encourage shredding) by sprinkling some dried herbs/plant mix on it for your bun to root out. Scamp loves a mat to sit on and this one was really quick to make, much faster than the woven mat I tried, and just used free scrap cardboard so cheap too. Let me know if you give it a go and what your bunny thinks! For the last four years the PDSA has published the PDSA Annual Well-being Report (PAW Report for short). It covers cats, dogs and rabbits and looks at welfare issues by asking pet owners and vets questions about care and welfare. You can read my summary of previous reports here: 2011, 2012, 2013. It’s great to have these stats on things like how many rabbits are neutered and whether they get an appropriate diet because it helps welfare campaigners monitor how successful they are at implementing changes and also where to target change. One of the biggest changes is the rapid decline in muesli based dry foods. In the last four years it’s dropped from being eaten by 49% to 25% of rabbits. Interestingly it’s been a sustained change, continuing this year, not just a short term reaction to media coverage. On the other hand in the last year there hasn’t been much progress on hay eating; the percentage not eating a good portion of hay has gone up very slightly. That might be an area that needs a little more focus. 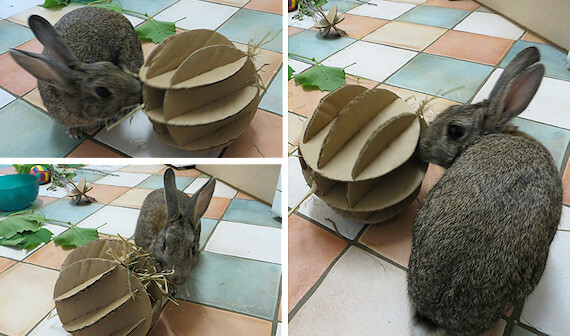 It can be tough to get rabbits not used to eating hay to make the change, it can take quite a bit more effort than picking up a different dry food brand. One of the focuses in this years report is obesity, whilst they don’t delve into too much details specifically for rabbits, I do think it’s something that needs monitoring. It’s easy for rabbits to put on weight when eating too many pellets. General health care hasn’t done well over the last 12 months; the numbers of rabbits neutered/vaccinated has gone down. I’m slightly surprised about this as I’d have expected it to at least hold steady. It would be good to get vaccination stats up – cats/dogs are managing 70-80%. I think vaccination is good for more than just disease prevention, it means rabbits get an annual health check giving vets the opportunity to give advice on other subjects like neutering and diet. Reassuringly, 91% of rabbit owners would contact their vet first thing in an emergency situation, apparently rabbit owner’s second step would be to search for help online. This year the PDSA asked owners about where they got their rabbits: 39% came from pet shops, 21% from family and friends and 15% were rescues. Whilst 15% of rabbits being adopted from rescue isn’t bad, 24% of cats and 35% of dogs came from rescues, so I think we can do better. On the reasons behind getting a rabbit, 26% got a rabbit because ‘children wanted a pet’. That’s 1 in 4 rabbit being bought for children and couple that with that fact that ‘children getting bored’ is one of the most common reasons rabbits are given up to rescues – I think that’s a statistic that would benefit from some work to change it. Personally, I think the main problem is getting the information out there. If you research, particularly online, there are plenty of resources on good care. But, it’s very hard to reach the people from that aren’t looking for advice or don’t know they need it. 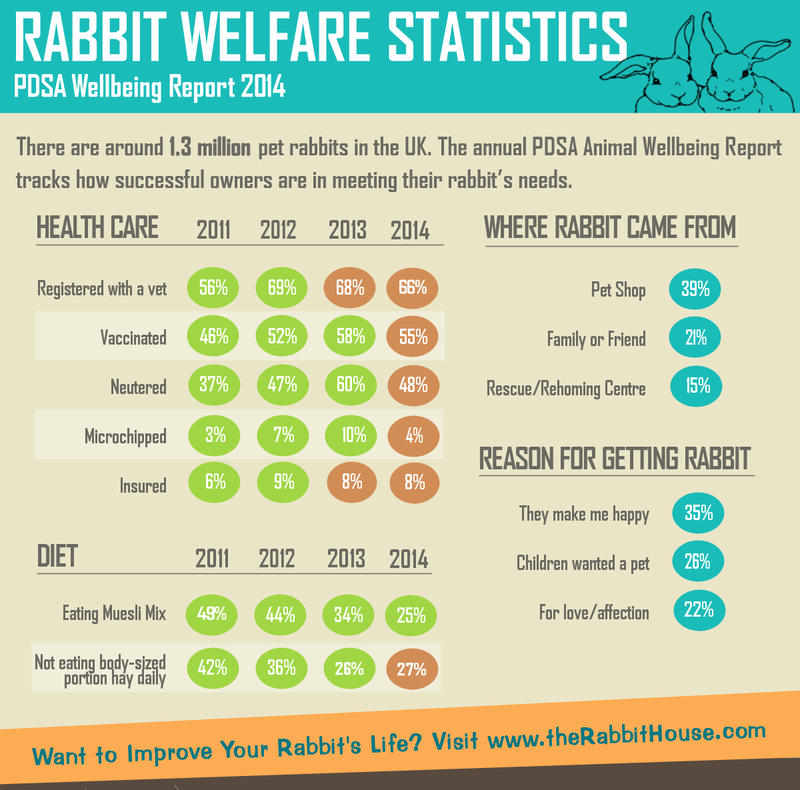 What do you think the biggest welfare issues facing rabbits are? And do you have any ideas for tackling them?